Sinkevych, Dionisii [Сінкевич, Діонісій; Sinkevyč, Dionisij], b ? Rozdilie, Galicia, d ca. 1732 Engraver. 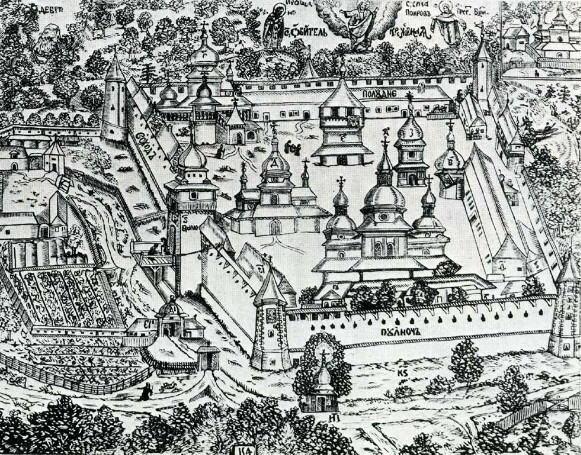 The hegumen of the Krekhiv Monastery (1690–1700) and Saint George's Monastery (Lviv), he did a large woodcut engraving of the Krekhiv Monastery (1699), which is of interest to historians of wooden architecture, and illustrated the Acathistus (1699), Hirmologion (1700), and Triodion for Eastertide (1701) published in Lviv. Western influences are evident in his work. A referral to this page is found in 6 entries.